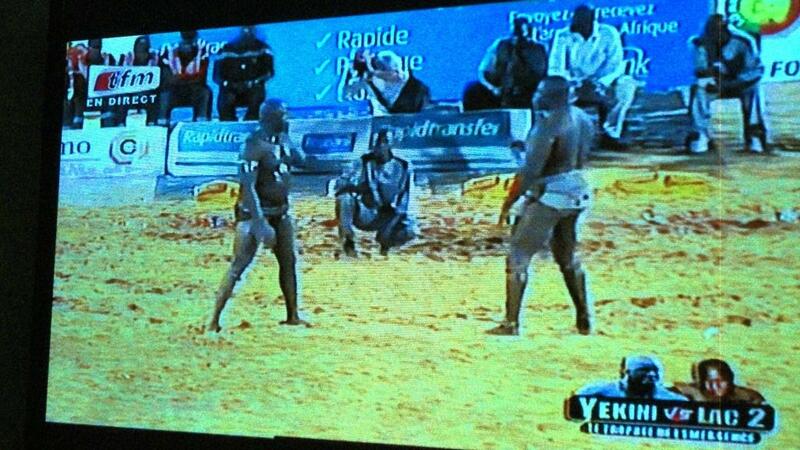 Senegal is famous for its wrestling. This past Sunday, the mega match was Lac 2 vs Yekini. Lac 2 was the underdog, Yekini being a long time favorite/champion. At the hotel, staff watched the earlier matches on TV, along with internationals like me. We then hopped in a taxi to go to dinner, invited through colleagues to a home. At the house, wrestling was on the TV. Later … while eating, Grandma let out a shriek of joy and came running into the room, elated and smiling and happy as happy can be: Lac 2 beat Yekini! Lac 2 is of her tribe, and she was hoping for the upset! — A snapshot of the TV screen. Lac 2 is on the left, smaller than Yekini.